Here is my Chart of the Day Friday summary covering markets, technicals, sectors and stocks I am interested in. You can find these on Linkedin too, so please connect with me there for daily content updates. You can click on each chart title below for more information. 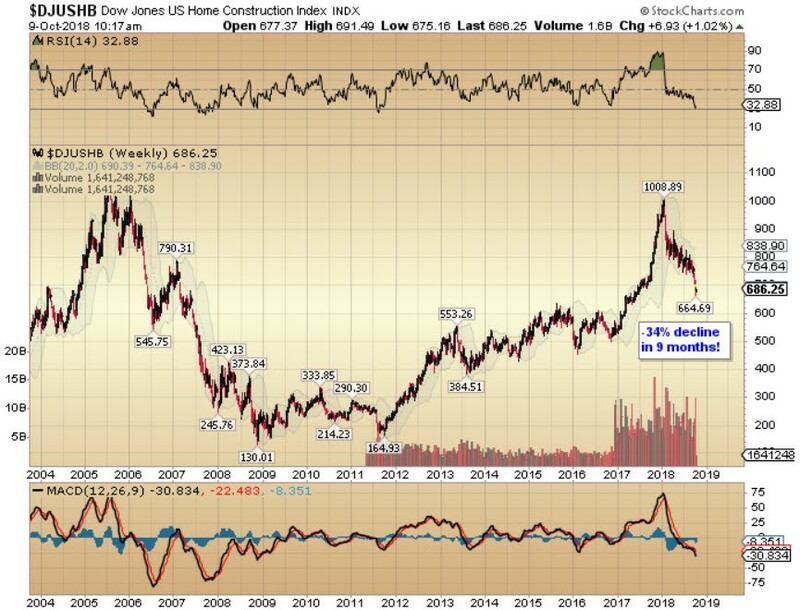 Implosion in US Home Construction Stocks - US Home Construction stocks have lost one third of their value in just nine months. The steep decline is reminiscent of the collapse in this sector in 2006/7, ahead of the last financial crisis. The recent rise in interest rates are taking their toll in the debt-laden US economy. Warning signs are flashing everywhere and the stock market is pregnant with risk. It may take another 6-12 months before the broader market rolls over, or it could happen much sooner. Emerging markets have already been hit with 20% declines and European markets are losing momentum also. Tech Leaders Retreating - The US Technology sector has been on fire in recent years. The tech leaders have accounted for the vast majority of the gains of the entire US stock market. Today, Apple, Amazon, Google, Microsoft and Facebook are worth a combined $4 trillion or 20% of US GDP, a remarkable achievement. Outside the US however, the picture is a little less favourable. 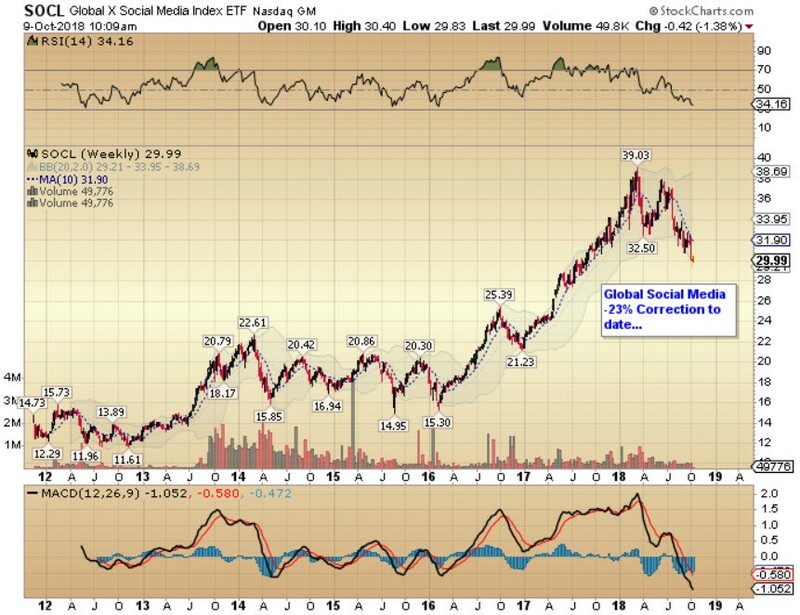 SOCL, the Global Social Media Index ETF has corrected by -23% since the start of 2018, giving back a significant proportion of last year’s gains. As Good As Gold - There should be no doubt of China’s long-term intentions to replace the US as the world’s global superpower. Part of that process is providing an alternative to the US dollar as the world’s reserve currency. Chinese policymakers have a long way to go in this regard but they are making progress. In 2015, China announced that the renminbi would no longer be managed against the USD but instead against a basket of currencies. The volatility of the renminbi has increased over the past three years, but something else interesting has happened more recently. 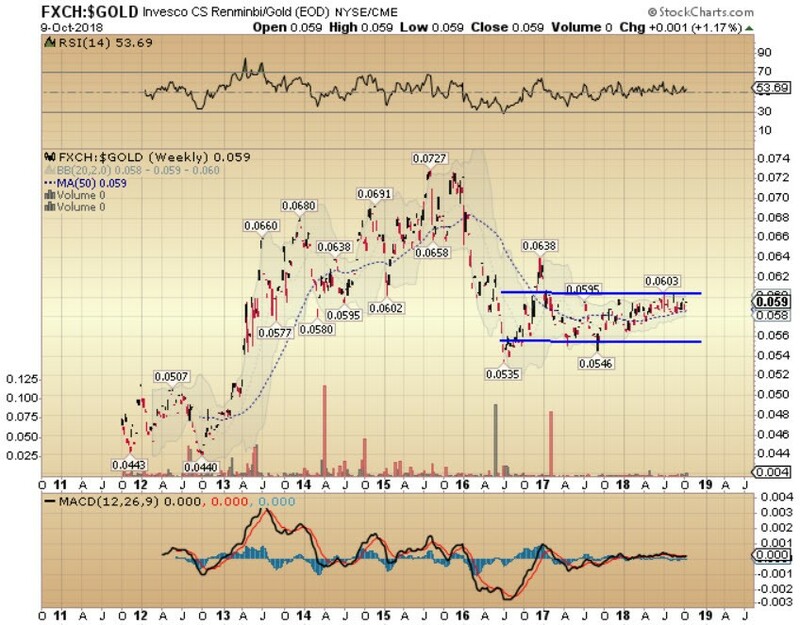 Renminbi volatility versus gold has declined sharply. Trouble Brewing - Trouble is brewing in global equity markets, as I have been highlighting for months now. Dams are starting to break and risks are running high. 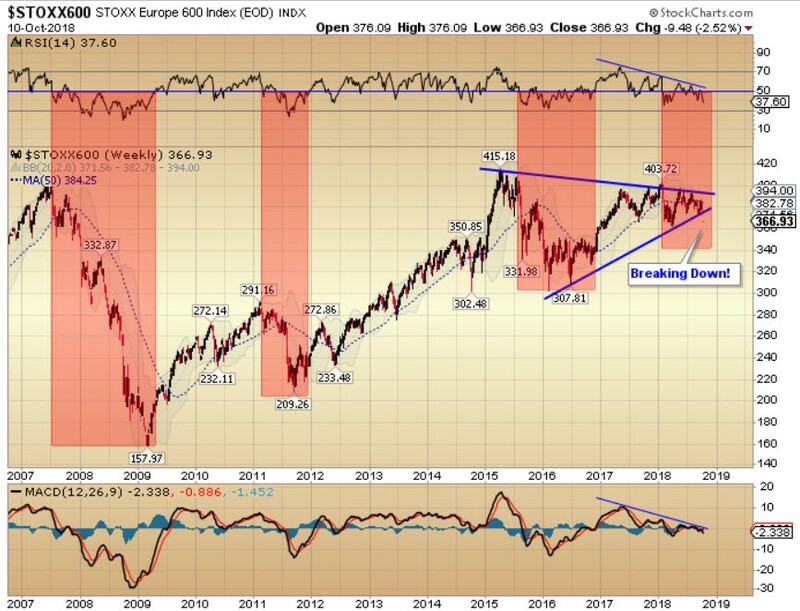 European equities, measured by the STOXX Europe 600 Index, have been consolidating in a range for the past three years but look to be breaking lower now out of that range. There is a lot of room to fall. Emerging market equities, measured by the iShares MSCI Emerging Markets ETF, broke out to new all-time highs in January 2018 but have reversed sharply lower falling -24% in the intervening period. Trend Reversals - US equities have acted as a port in the storm in 2018 while the majority of other asset classes have delivered negative returns for investors. Unfortunately, it looks like the US stock market is now joining the herd and rolling over after putting up an incredibly strong relative performance in recent years. 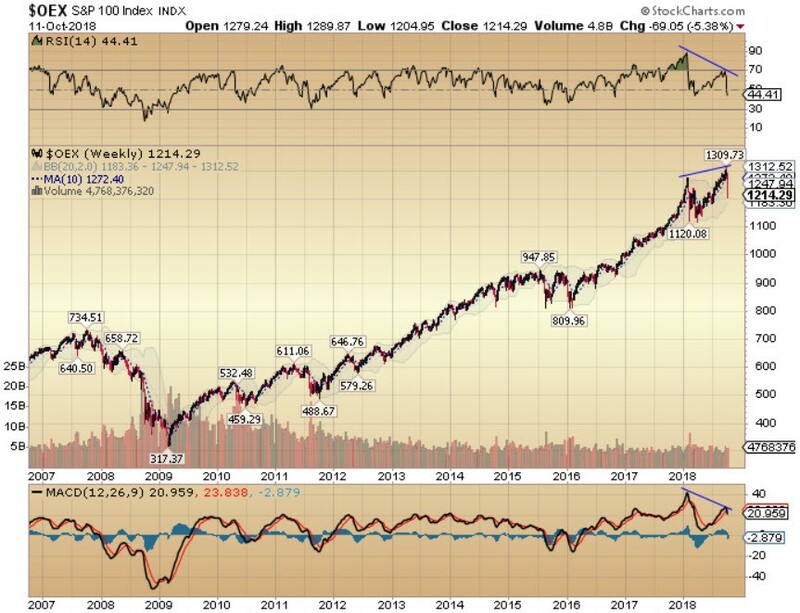 The S&P 100 Index made a slightly higher high in October 2018 but the underlying trend has weakened sharply. Relative strength and momentum are declining, signaling that the market is set for a reversal. Join a growing list of savvy readers and get exclusive content for free. No spam, ever. Just great stuff.